We are studying the role played by RNA in living cell applying the methodologies of chemistry and biology. In particular, my research group is pursuing studies in the function and mechanism of non-coding RNA, nucleic acid synthetic biology and RNAi therapeutic application. 4. Dezhong Qu, Li Zhou, Wei Wang, Zhe Wang, Guoxing Wang, Weilin Chi, Biliang Zhang*.5-Ethynylcytidine as a new agent for detecting RNA synthesis in live cells by “Click” chemistry. Analytical Biochemistry 2013, in press. 5. Fujun Han*, Biliang Zhang*, Characterizing cell-cell interactions induced spatial organization of cell phenotypes: application to density-dependent protein nucleocytoplasmic distribution, Cell Biochemistry and Biophysics , 2013, in press. 6. Wei Wang, Ke Chen, Dezhong Qu, Weilin Chi, Wei Xiong, Yanxiang Huang, Jian Wen, Shipeng Feng, Biliang Zhang*. One pot conjugation of small molecules to RNA using click chemistry. Tetrahedron Letters, 2012, 53(5), 6747-6750. 7. Li Zhou, Zhifei Chen, Xiuqun Yang, Wei Wang, Biliang Zhang*, Mono-methoxy- poly(3-hydroxybutyrate-co-4-hydroxybutyrate)-graft-hyper-branched polyethylenimine copolymers for siRNA delivery, Biomaterials, 2012, 33(7), 2334-2344. 8. Fujun Han*, Peizhou Liang, Feifei Wang, Lingyun Zeng, Biliang Zhang*, Automated Analysis of Time-lapse Imaging of Nuclear Translocation by Retrospective Strategy and Its Application to STAT1 in HeLa Cells, PLoS ONE, 2011, 6 (11), e27454. 9. Miaojuan Chen, Dezhong Qu, Weilin Chi, Wei Wang, Xiaoshuai Ren, Shujie Cong, Peizhou Liang, Shipeng Feng & Biliang Zhang*, 5-Ethynyl-2′-deoxyuridine as a molecular probe of cell proliferation for high-content siRNA screening assay by “click” chemistry. Science China-Chemistry, 2011, 54(11), 1702-1710. 10. Dezhong Qu, Guoxing Wang, Zhe Wang, Li Zhou, Weilin Chi, Shujie Cong, Xiaoshuai Ren, Peizhou Liang, Biliang Zhang*. 5-Ethynyl-2'-deoxycytidine as a new agent for DNA labeling: detection of proliferating cells. Analytical Biochemistry 2011, 417, 112-121. 12. 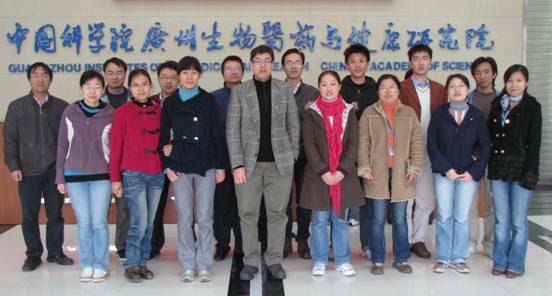 Baojian Liao, Xichen Bao, Longqi Liu, Shipeng Feng, Athanasios Zovoilis, Wenbo Liu, Yanting Xue, Jie Cai, Xiangpeng Guo, Baoming Qin, Ruosi Zhang, Jiayan Wu, Liangxue Lai, Maikun Teng, Liwen Niu, Biliang Zhang*, Miguel A. Esteban*, and Duanqing Pei. MicroRNA cluster 302-367 enhances somatic cell reprogramming by accelerating a mesenchymal-to-epithelial transition. The Journal of Biological Chemistry. 2011 286,17359-17364.